Joseph & His Brothers is the image for December in my new calendar, The Jewish Eye 5779/2019 Calendar of Art. This acrylic painting is part of a series of works on paper that illustrate the Book of Genesis. Several of these were in my calendar last year. The Birth of Seth, also in this year’s calendar, is another example. Each painting begins with a tonal “brush drawing” in dark brown, and is completed with washes of color in an earthy palette. I love the story of Joseph. It comprises the best and the worst of human nature, teaching us how to be and how not to be; how family dynamics ebb and flow between trust and betrayal; how people learn – or fail to learn – from their mistakes. 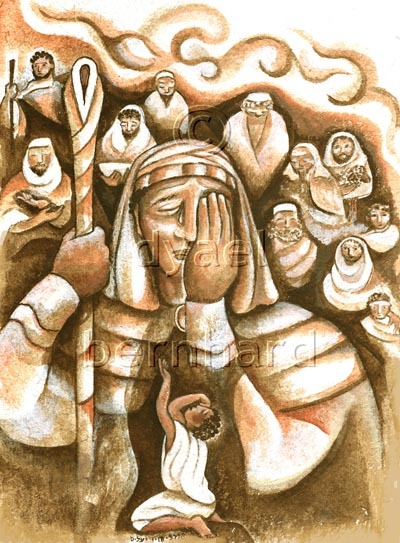 In the passage of Torah depicted here, Joseph grapples with his deepest childhood wounds even as he struggles to embrace the brothers who inflicted those very same wounds. How I understand that inner angst! For I have had a rocky relationship with my own sister all my life. I chose this moment in the story to illustrate because although my sister didn’t throw me into a pit or sell me into slavery, I felt emotionally cast away as a child. Years later, I know what it’s like to feel torn by ambivalence. Two friends in my life have lost their brothers this month. I’ve never had a brother, but I do know the gaping hole left behind when a loved one departs. In the story of Joseph, his brothers take him to be dead for many years before they discover he is not only alive and well, but helping to rule the land to which he was banished as a slave! I might have chosen to paint this moment of revelation, and the brothers’ speechless astonishment, instead. Would that my friends could be granted such a twist of fate! Alas, it is not to be so – but those who grieve are not alone. The Torah amplifies our losses and longings as siblings – for in many ways, they are our own, even three thousand years later. The Jewish Eye 5779 /2019 Calendar of Art is now available in my webstore and on Amazon. Please tell your friends about it! You don’t have to be Jewish – or use a printed calendar to keep track of your life – in order to enjoy having this unique art calendar on your wall. It makes a lovely gift. This entry was posted in calendars, Image of the Week, Jewish Learning. Bookmark the permalink.